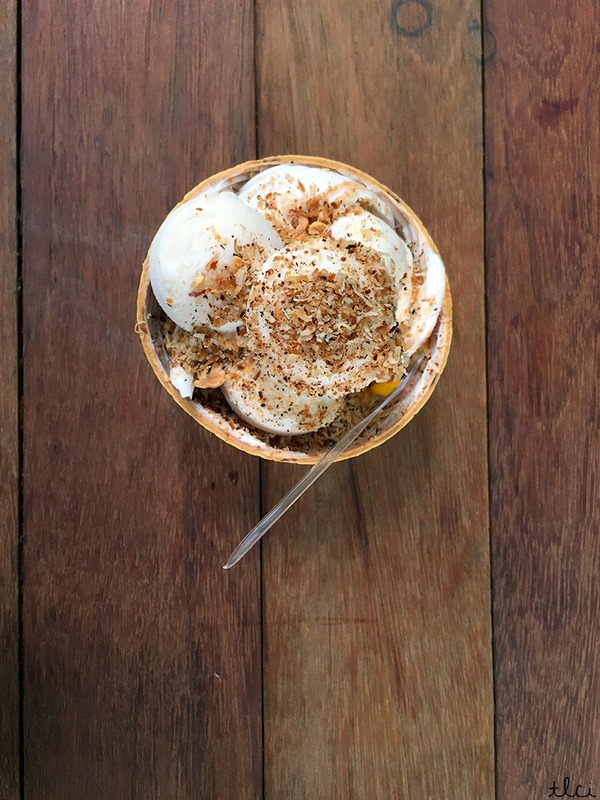 It just so happens that I chance upon the infamous Sangkaya coconut ice-cream everyone is talking about on Facebook at The Markets, Jaya One. 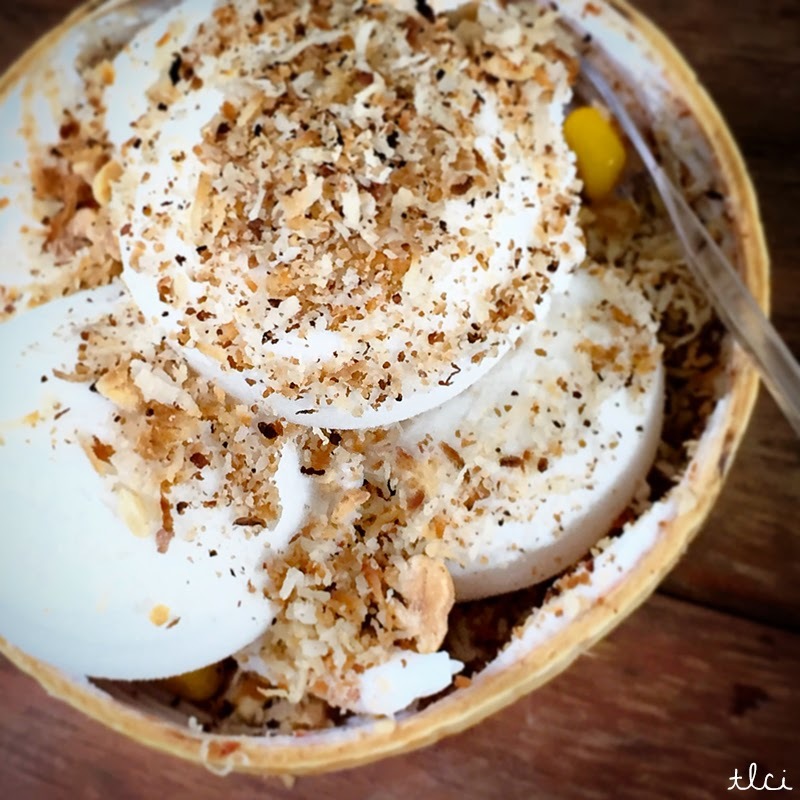 It sure is high time someone just replicate the coconut ice-cream in Bangkok so we locals can enjoy the taste of coconuts and monkeys running about in our tongue. Curious, I bought their signature at RM9.90 and watch as my ice-cream unfolds right before my eyes. I was asked to choose 3 kinds of toppings so my choice was char roasted coconut flakes, peanuts and corn. Halfway eating, I started to drip ice-cream all over myself and the floor no thanks to the cracked coconut shell given. I wonder if that's on purpose or my shell was "defective". My verdict? It tastes close to the coconut ice-cream in Bangkok but creamier and smoother. Bangkok's taste fresher, purer and melts in your mouth. Our signature. A palatial taste of coconut haven purest to the bud hand crafted to perfection. 4 scoops of premium coconut ice-cream, 3 all natural topping choice served on a coconut husk with flesh strips. Classic sundae in the name of good indulgence. With a personalised condiment flair. 3 scoops of premium coconut ice-cream, 1 all natural topping choice served on a 5oz takeaway cup. The cult waffle cone on the move. Now with a tropical twist. A scoop of premium coconut ice-cream, served on a crispy waffle cone with a sprinkle of char roasted coconut flakes. Nature's miracle water; super hydrating; nutrient packed; potassium stack; mega electrolyte; it needs no introduction. 100% fresh & all natural coconut water that contains no added sugar power packed into a 12 ouncer. i will try one day! i wanna eat this again, already missing how tasty it was!